What a week it has been!! This week has been full of transitions, stress, but mostly.. Miracles! 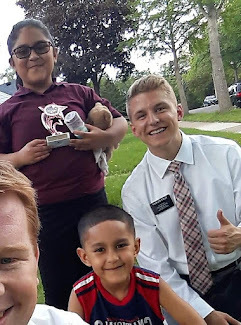 So, if you didn't get the news already, I get to train another new missionary! And, surprisingly enough, yet another English speaking companion. That makes 3 in a row now! haha. We headed up to the mission home on Wednesday and I picked up my new greenie, Elder Nielson. And no, not the legendary Elder Nielson serving in Estonia, Sadly! But he is super awesome and easy going. We are off to a crazy start going into a new area. We both took over the sister's area here in Faribault so we have been crazy busy trying to get to know everyone. But a plus, I'm pretty sure we have the cleanest apartment in the mission! We're going to try our best to keep it that way! lol. We've met several other investigators previously taught by the sisters. One guy, Kevin, is this absolutely ripped 50 year old man, and he's awesome. He's a little stubborn with keeping commitments, but it seems like deep down inside he's searching for more in his life. And he has been praying about being baptized on September 24th. His mom recently passed away and we reviewed with him the principles of the plan of salvation that gave him a lot of comfort. I find it hard to imagine going through life without the reassuring knowledge of life continuing after death. We lived with God before this life and we accepted God's plan to prepare a way through his Son Jesus Christ to make it possible to return to him. There's so much comfort in this eternal truth and many of us take it for granted! Another amazing blessing: There's LOTS of Hispanics in our area!! Whoo! I've gotten to teach about 4 lessons in Spanish this week and, man, I've missed it so much. The sisters were teaching this cute young Hispanic family, la familia Bermudez. And they have been reading in the Book of Mormon! Hopefully we can help them continue to progress and come to church. The sisters here were teaching an older gent named Bob. 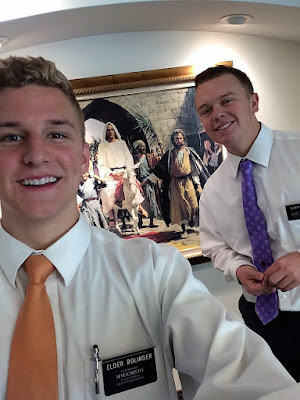 It was sweet because, since the sisters were in my district, I got to meet Bob for his interview before I was transferred to the area. 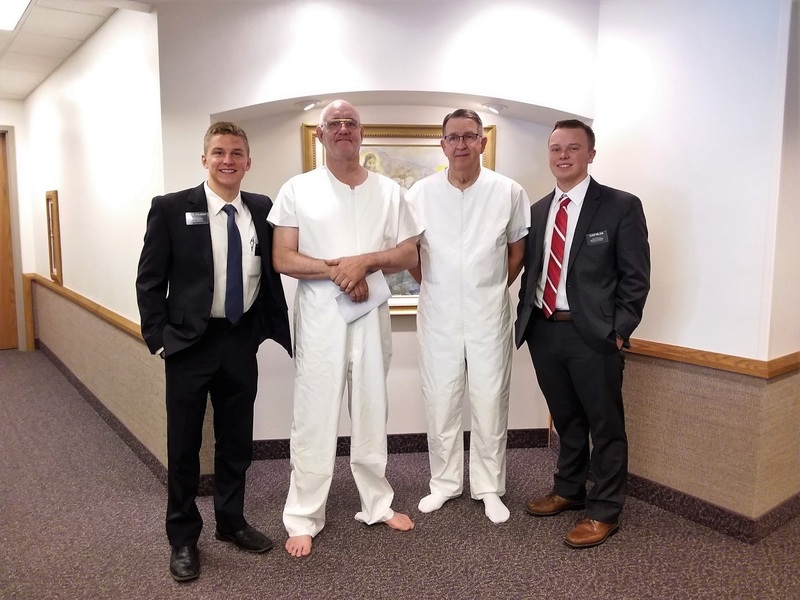 I was able to meet Bob and do his baptismal interview a few weeks ago and he is incredibly humble and super smart! Unfortunately, we had to push the date he was supposed to be baptized back a bit. He had some struggles with quitting smoking before he was baptized. But they set a new date for him. He wasn't sure he was going to make it the two weeks before his baptism, but we got to meet with him a few times this week and had a really powerful lesson with him on relying on the Lord. And he pushed through it and made his date! We had to rush and put together all the details for the baptismal service, but everything went smoothly! It was so cool to meet Bob and help him make the final leap of faith and see him enter the waters of baptism. 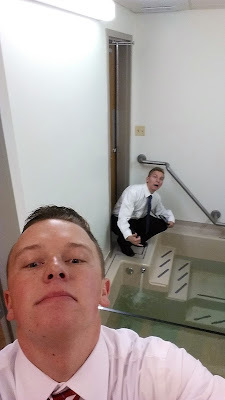 Granted, credit must be given to the sisters, but what an awesome start to a new area and my companion with a baptism in the first week of his mission! Whaaa? Haha. It was a powerful experience. And another awesome miracle, Kevin came!! He said he wasn't going to come because he was too busy but decided to surprise us! He seemed really touched by the Spirit. It was a pretty hectic and busy week with trying to meet all the people in the area and organize the baptism at the same time, so we weren't really sure how the week was going to go. But we started praying fervently for more people to teach because we don't know a whole lot of people here and we need more investigators! Well I'm here to testify that the Lord DOES answer prayers! 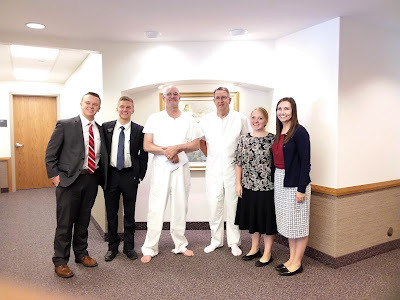 We had a lesson with Bob after church on Sunday and we wanted to go right into the New Member lessons and reviewing the missionary discussions with him. We meet him outside his apartment at this little table, and guess what… Bob brings a friend!! We introduce ourselves, and she says "Yeah, I'm Bob's girlfriend." We were like.. "BOB HAS A GIRLFRIEND!?!?" We had no clue! She told us she came up here from Iowa to visit for a few months. We taught them both a powerful lesson on the restoration and she accepted a copy of the Book of Mormon. Now we get to start teaching them both! Then right after that, we visited this lady from the ward who told us she was inactive in the church but recently started going again. She wanted to re-take the lessons so she could get a refresh on some of the gospel principles and teach her family. Then, all of a sudden, her husband walks in and says, "Hey, I'm not a member of your church, but is it okay if I sit in when you guys come?" We're like, “OF COURSE! !” We told him our message is actually geared towards families, and helps them grow closer together. The gospel of Jesus Christ blesses families! I've seen it bless my own family and change our lives. What an amazing answer to our prayers. I know the Lord's hand was guiding our work this week. We are super excited to go have dinner with their family next week! I want you all to know how much I love and appreciate you all! I know that our Savior lives and loves us. His church and gospel are restored in its fullest on the earth today. His gospel is the path that guides us to true joy and eternal life. With all the craziness going on in the world, the solution to all of our problems can be answered through the gospel of Jesus Christ. We can impact everyone around by following his example! Go share your light with someone this week, and be an answer to someone's prayer!